The Tether Tools Rock Solid LoPro Phone Mount is a smartphone/accessory holder, designed for mounting a phone, action camera, or small device on any 1/4″-20 compatible photography arm, clamp or grip. The spring-loaded universal phone mount offers a wide holding range of 2.17″ (55mm) up to 3.35” (85mm) for varying phone/device sizes. The clip features cushioned, non-skid pads on each interior side of the clip, protecting the smartphone or device and holding it firmly in place. 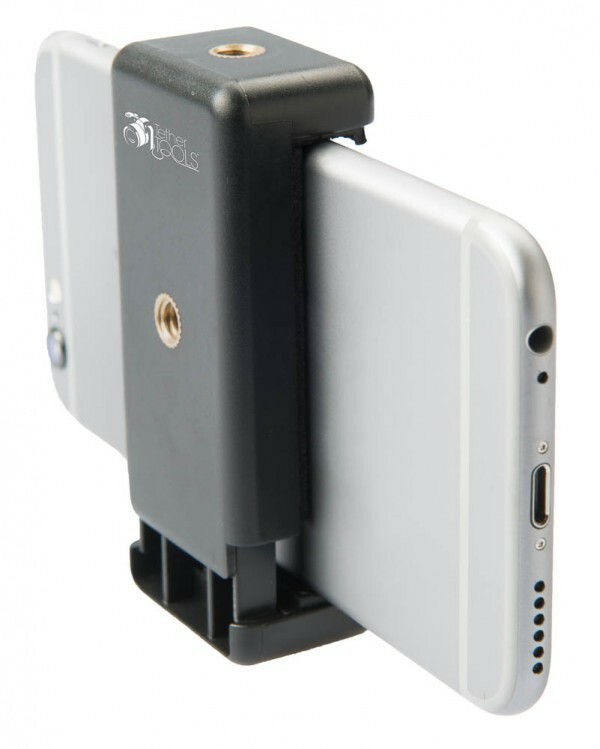 The back and bottom of the Phone Mount have a standard 1/4″-20 mount receptor for quick and easy attachment to any 1/4”-20 supports such as tripods, articulating arms and EasyGrip Clamps – which come equipped with male 1/4”-20 threads. The top of the device also has a ¼”-20 receptor for mounting small lights, microphones or other accessories as needed.